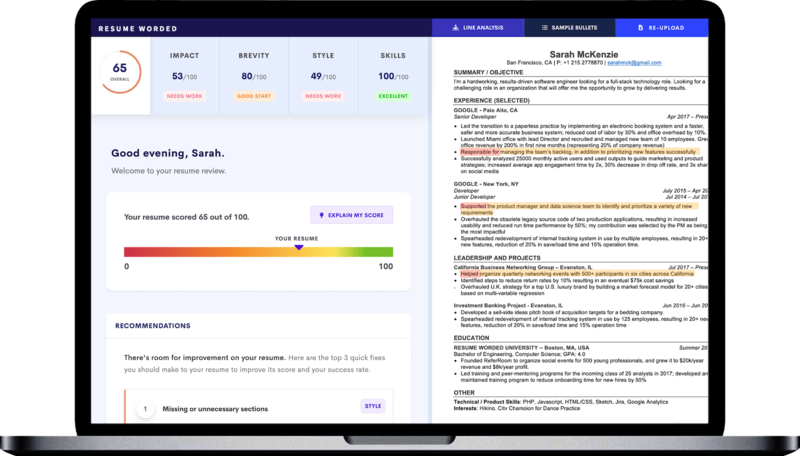 Designed by top recruiters, our AI-powered platform instantly gives you tailored feedback on your resume and LinkedIn profile. Land 5x more interviews, opportunities and job offers. Join over 50,000 experienced professionals, graduates and students who have used Resume Worded's toolkit to get ahead in their careers. Score My Resume scores your resume on key criteria recruiters and hiring managers look for. Get actionable steps to revamp your resume and land more interviews. Successful job applicants have already spent hours crafting the perfect resume lines that got them interviews at top-tier companies. Find a line similar to your own experience, tweak it and use it in your resume. 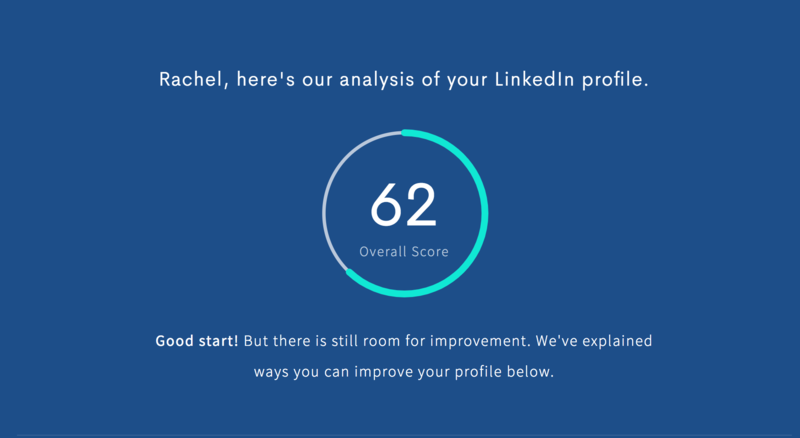 Instantly get tailored feedback on how to optimize your LinkedIn profile, for free. Generate 5x more jobs, leads and opportunities. Struggling to write your resume? Don't worry. We have over 250+ sample bullet points from top resumes across all industries and skills. Use our templates and sample lines to quickly write an effective resume from scratch. With Score My Resume, you can improve your resume one upload at a time. Unlike any other tool, you get specific feedback on your resume's content, including on each bullet point. Resume Worded has helped hundreds of people land jobs at top companies like PwC, Google, Amazon and Credit Suisse. Our AI-powered technologies have been designed by real hiring managers and provides actionable feedback on your LinkedIn profile and resume. Let's say you apply to or get contacted by a recruiter for 50 job openings. Out of those, your resume might get you 5 interviews, and out of those, you may end up getting one job offer. 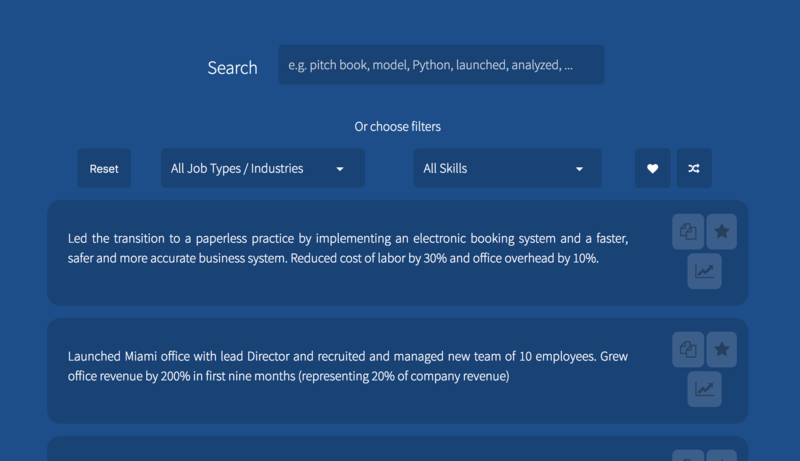 Resume Worded optimizes this job search funnel. With LinkedIn Review, you'll get contacted by more recruiters for more jobs on LinkedIn, thus widening the top part of the funnel. With our resume tools, you'll then be able to ensure you are maximizing the conversion of those jobs to interviews. The only complete resume and LinkedIn toolkit. Start getting more opportunities and interviews today. Coach your clients at scale and increase your efficiency with our platform built for career coaches, counselors and recruiters.